Focal XS Book review | What Hi-Fi? If you spend a lot of time in front of a laptop or desktop computer, chances are you'll want a little background music. But your average computer's built-in speakers sound about as endearing as a flu-ridden X-Factor reject. Your best bet to improve this is to invest in a pair of desktop speakers. Focal is better known for its dedicated hi-fi speakers, but you'd probably think that such an established manufacturer would have all the right tools, and speaker parts, for the job. And you'd be right. The XS Books are decent-sized speakers. 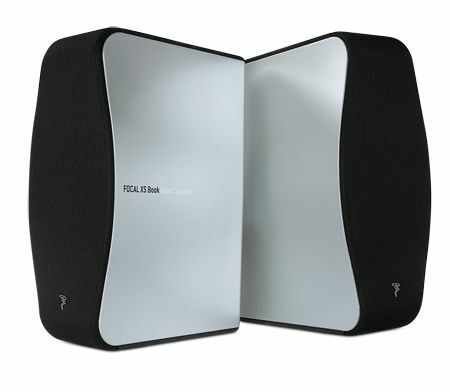 Much taller and larger than the likes of B&W's MM-1s, the XS Books are about as big as we'd like a desktop speaker to be. They're built with traditional materials: a 19mm aluminium dome tweeter is employed alongside a 10cm polyglass mid/bass driver. There's even a vented bass-reflex port to help improve bass performance, while a 20W per channel amplifier in the right speaker completes the internal specification. You can connect external sources via either the 3.5mm input or the pair of phono connections - the relevant cables are also supplied in the box. A dial on one speaker doubles as a power switch and volume control. There's no remote control. The speakers are perfectly at home with classical music. When dealt John Williams' score to the recent TinTin film, the speakers sound spritely and dramatic. Instruments are positioned well, within a concise soundstage. They give no impression that they're holding back, nor do they sound as if they're on the very limit and having to work overly hard. Swap to the spritely Animal by Neon Trees and the expressive, nature of their delivery is brought to the fore. The track bounces along tunefully without hesitation. The sheer sense of scale and weight produced by the Focals is a real advantage over other desktop speakers at this price, some of which are a compromised due to construction or size. It'll be interesting to see how they stack up against close rivals.